Everyone knows one the best things about getting a year older is the dessert. Whether you're into traditional flavors or mixing it up or even vegan pie in lieu of the expected layer cake, some sort of vehicle in which to attach/blow out candles is an important ritual to mark the upcoming year. And if your wish is to have a really good dessert, then you guarantee said wish coming true only moments later, which is really smart thinking if you consider the wish-granting odds. Just kidding, I totally believe in that sort of thing (really). This birthday baking took place in honor of Gram, who we had a birthday gathering for last weekend. Gram has always been a fan of the raspberry coconut combo found in Hostess's Raspberry Zingers (remember those?) and my sisters and I remember them being hard to find when we were kids. Now that we're no longer kids (and I think they might still be tough to find), I thought I would try to recreate this snack cake in birthday cake form. 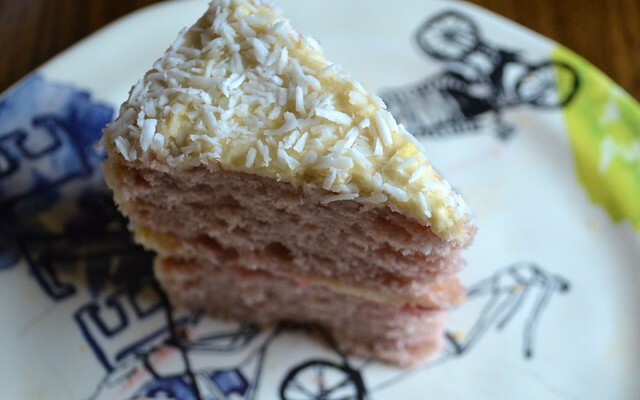 I wasn't totally sure if the raspberries should be something incorporated into the batter, into the icing, both, or if the coconut was present somewhere other than the flakes on the outside of the cake. It had been a long time since I'd had a Zinger and my memory was feeling faint. Okay: begin by preheating your oven to 350 degrees. Prep two mini round 6" cake pans with butter. Line the bottom of each pan with parchment paper and add (yes) even more butter. Set aside. While you're at it, you can also prep a 6 cup muffin tin with cupcake liners or more butter, as this recipe will have enough batter for two 6" rounds and about 6 (yay!) medium-sized cupcakes. Note: Don't have mini cake pans? Don't believe in mini cake? You can double this recipe for a three-layer round (or square) 9" cake. 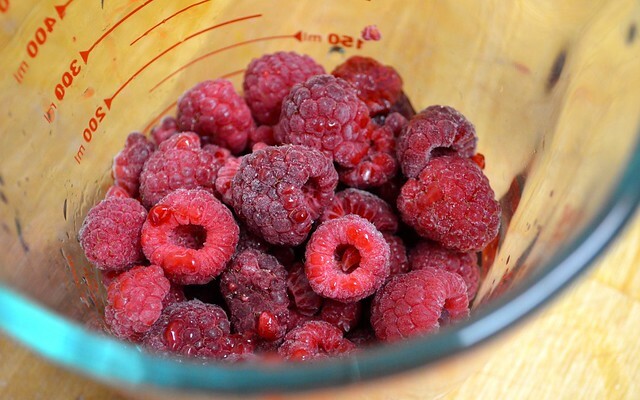 In a food processor or blender, pulse your frozen berries for about ten pulses until broken down but not fully liquified. Set aside. In the bowl of an electric mixer, add your flour, sugar, baking powder and salt and whisk together until evenly combined. 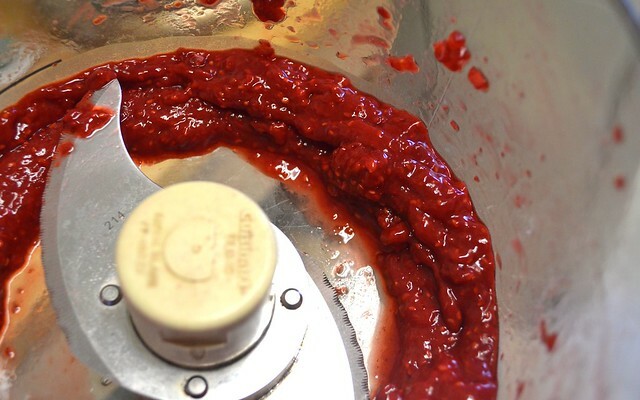 Switch to the paddle attachment and add your butter (cut into tablespoon size pieces will work) and raspberry purée. Beat on medium speed for 2-3 minutes. 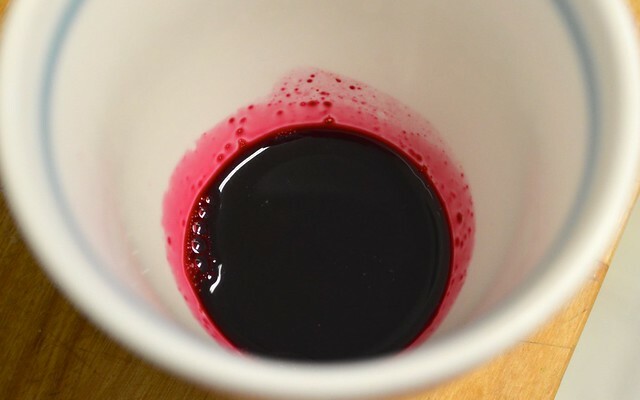 In a separate bowl, whisk together your egg whites, milk and beet juice. 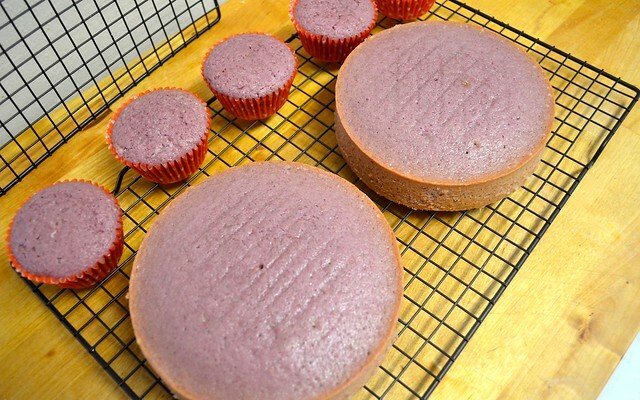 Don't be alarmed at how dark red the beet color appears: it will fade significantly while cooking, but still give that pop of expected pink that you look for when you announce "It's raspberry-flavored" as you cut into the cake. 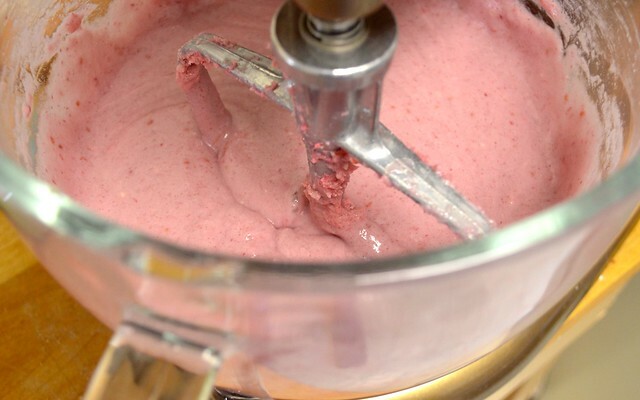 Add the egg white combo to your batter in three increments, mixing well with each addition. Distribute your batter into the prepared pans and cupcake tins and bake for 30-35 minutes for the rounds and 15-20 minutes for the cupcakes, rotating halfway through, or until a toothpick comes out clean. As always, a good trick (beside the toothpick rule) for knowing a cake's doneness: Has the cake pulled away from the sides of the pan? If you tap the top lightly, does the cake bounce back? If your cake is still touching the sides with no bounce, continue cooking in 2 minute increments to avoid over-doneness. Allow to cool in the pans for 10 minutes before flipping out onto wire racks. Let cool completely. If you plan on icing the same day (the cake can be baked a day in advance), you can get started on your frosting. The first step is the most important one: sifting the powdered sugar. I know it probably seems like you can just whisk out the lumps or that no one will notice, but it's a tedious-but-crucial step to not only pretty cakes but avoiding big bites of hard sugar in your frosting. Sift the sugar into a large bowl. Start with about 3 cups; this way, you don't sift more than you need (maybe) and if you need more, well, you sift more. 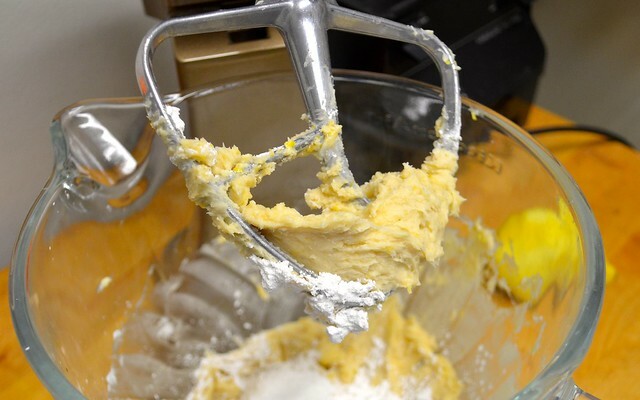 In the bowl of a stand mixer, beat your softened butter on slow-medium speed until whipped and fluffy, about 2-3 minutes. Add your lemon zest and vanilla extract and beat for another 30 seconds. Begin to add your powdered sugar in half cup increments until you've achieved your desired texture. How do you know it's the right texture? It should be thick enough that it holds its shape (think scooping like you would ice cream) but still spreadable. I stopped at around 3 1/4 cups of sugar, but it will vary depending on your room temperature and particular taste. 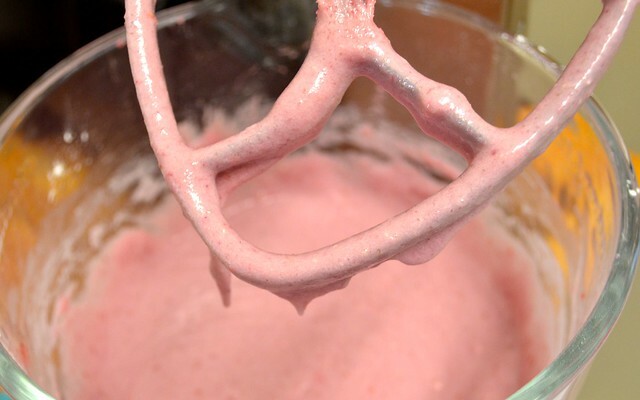 Once you've gotten it where you want it, add your milk and whisk for another minute. One thing that made frosting this cake really easy is that you don't have to worry about it being perfect or even decorative. Why? 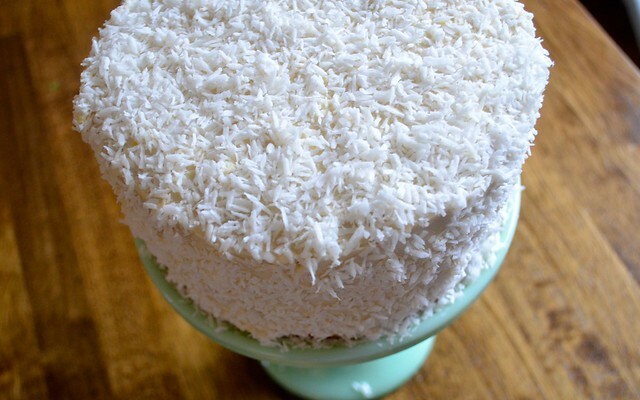 Because it gets covered in a forgiving layer of coconut! Start by putting a generous dollop of icing between the two layers: one side gets frosting, the other side raspberry jam (if using) and then they get sandwiched together. Using a flat knife or spatula, generously spread your frosting over the top and sides of the cake. 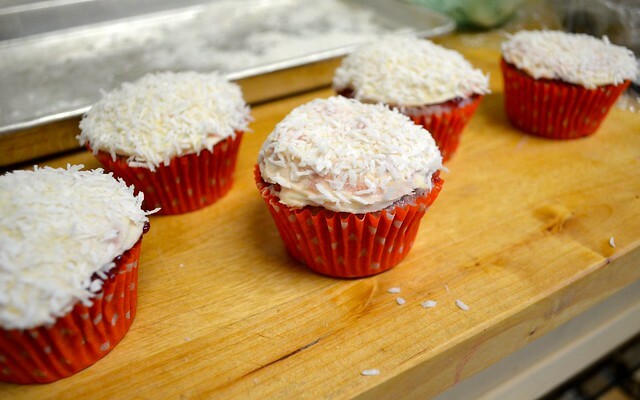 Immediately cover with coconut to ensure that it sticks. An easy way to do this is to set your cake stand on a walled sheet pan. Cover with coconut, allowing the tray to catch the excess so it isn't wasted. 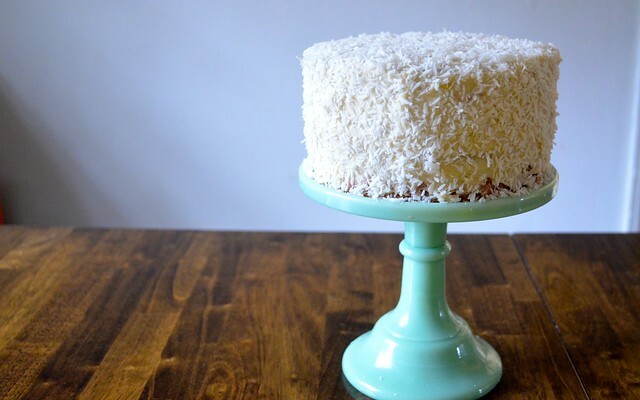 For the sides of the cake, press (gently) so that the coconut sticks to the sides. And there you have it. A zinger snack cake, all grown up. Happy birthday, gram! 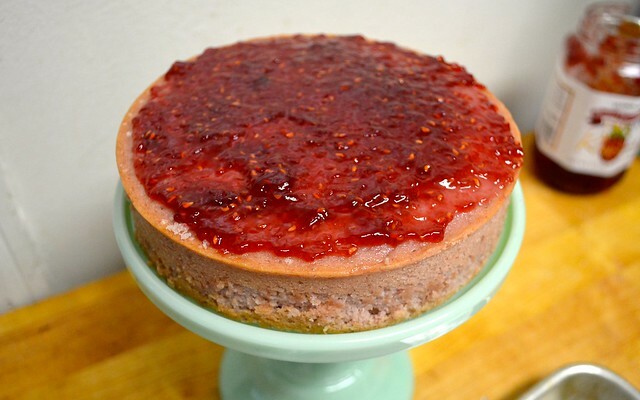 If you're into fruit and nut combos, try this raspberry walnut tart. What about fruit and cheese? Try these raspberry ricotta scones. Want to get back to that carrot cake? Here you go.